The last of what would turn out to be a mere handful of films by this major director, a relatively meagre opus which nevertheless houses some of the most remarkable and lyrical images to have ever been created on film, The Sacrifice (Offret sacrificatio) is undoubtedly Tarkovsky’s cinematic last will and testament. 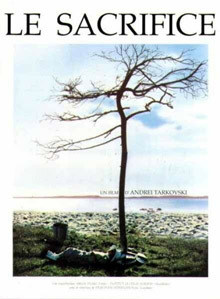 Completed when the director had already been diagnosed with terminal cancer, the film bears all the signs of being a sort of summa of all the familiar Tarkovskian themes and motifs and is, moreover, explicitly dedicated -“with hope and confidence”- to Tarkovsky’s young son, Andrejusja. In his own comments about the film, in Sculpting in Time and elsewhere, Tarkovsky consistently characterized the film as a spiritual parable exemplifying the particularly Christian conception of self-sacrifice in the interests of community and in the name of a higher ideal And, in fact, it’s not difficult to read Alexander, the protagonist of The Sacrifice, as a further development of Domenico, the “holy fool”, who in Tarkovsky’s previous film, Nostalghia (1983) -and, significantly, played by the same actor, Erland Josephson- immolates himself by fire while intoning the Christian injunction to repentance and self-abnegation from the top of Rome’s Capitol Hill. Read this way, Alexander’s setting fire to his house at the end of The Sacrifice is merely another, and more symbolic, version of Domenico’s act of self-martyrdom in the service of a Christian ideal. And yet perhaps the sacrifice of The Sacrifice is decidedly more complex and more pagan. As Tarkovsky himself recounted more than once, the original idea for what eventually became the major part of the screenplay of The Sacrifice had come to him long before the making of Nostalghia and was a story which he had always called “The Witch”. The nuclear apocalyptic scenario in which Alexander comes to make a pact with God was only added much later and it’s noteworthy that Tarkovsky’s attempt to bring these two stories together in the final version of the film, as we have it, has seemed to even usually favourable critics to have not quite succeeded. However one might ultimately judge the success or failure of this attempted narrative integration, if one looks for it one can certainly glimpse, amidst all the frenetic comings and goings of Alexander in front of the burning house, the image of a man kneeling in gratitude before a witch called Maria, the spectral and pagan counterpart, no doubt, of that Adoration of the Magi by Leonardo that opens the film and then reappears significantly at crucial points. Moreover, if Alexander’s pact with the Christian God obviously figures largely in the film, motivating the final great conflagration of the house, the film would also seem to explicitly invoke, through the mouth of Otto, the enigmatic postman, the thought of Nietzsche, the anti-Christ, and in particular the central Nietzschean “doctrine” of the Eternal Return, that “hardest of all thoughts to bear” which Nietzsche’s Zarathustra’s nevertheless calls his “greatest gift” to humankind. As the supreme and willing affirmation of each Moment in its eternal nowness, the Eternal Return is Nietzsche’s attempt to redeem the transitoriness of Time and to supply the only possible antidote to that life-denying and world-weary nihilism that clearly is Alexander’s major affliction as he reaches his fiftieth birthday. So perhaps it’s not simply a burning house then, but a Zoroastrian fire, that is throwing its light on Alexander’s genuflection before the “good witch”, Maria, and what is being enacted in this clearly-pagan ritual is less a Christian sacrifice of the self and more the supremely affirmative gesture of a Nietzschean self-transfiguration. The burning house of The Sacrifice would thus represent not only the culmination of Tarkovsky’s final film but of his life and work as a whole. For within its spectacular – and possibly Zoroastrian – flames the beautiful but gloomy and ultimately paralizing nostalgia, congealed in all those houses that have appeared so insistently in Tarkovsky’s other films, is finally not only dispelled but transfigured, into light, into madness and into laughter through the joyful affirmation of the Moment and of Life. Every gift is also a sacrifice, says Otto to Alexander; otherwise what sort of a gift would it be? By the same token The Sacrifice is also a gift, the gift of Zarathustra, the poetic testament left by a father to his son, a testament which shines with the brightness of a final willed self-transfiguration.